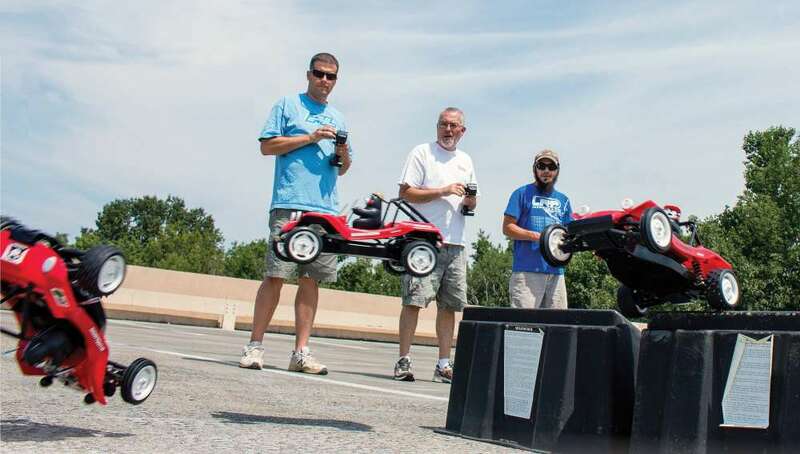 This article was originally published in RC Driver’s May 2015 issue. 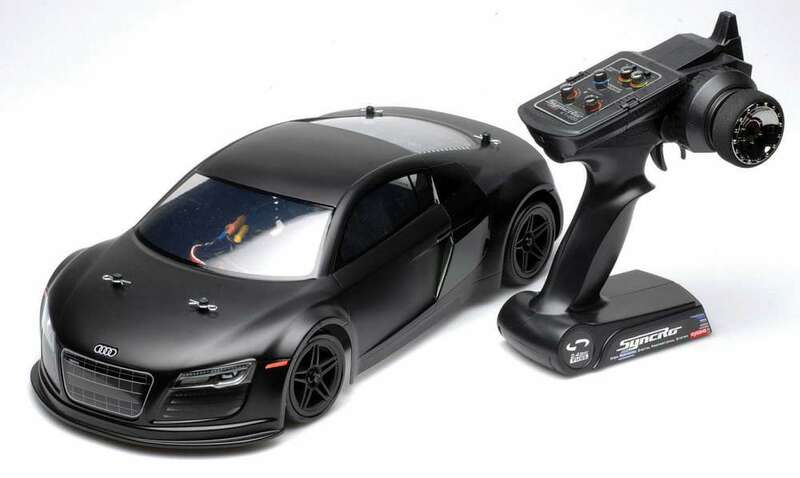 Whether you call them sedans or touring cars there’s no denying that these sleek machines are some of the most fun and scale looking RC cars you’ll find anywhere. Often featuring officially licensed bodies and extra scale features like mirrors, wings or lights, these are the closest we really get to functional scale models. We’ve gathered up several of our favorite touring cars and put them through the paces. Some have more scale details; some are faster, while still others offer a unique experience not available elsewhere. It’s time to hit the road running and we can’t wait! Team Associated’s touring car heritage is quite remarkable, dating back to its original entry into the category, the TC3, and followed up with the TC4. The Apex RTR draws inspiration from these plat- forms but adds its own stamp on things, evolving the A-Team’s platform to make it super friendly for the RTR market. The Apex Lexus RC F RTR is a complete RTR which means it includes everything in the box you’ll need, even the battery pack and charger. brake discs and calipers, grippy treaded tires pre-glued to 20-spoke molded wheels and great-looking decals. The lines of the Lexan Lexus shell perfectly match those of its larg- er cousin which we instantly loved. The Team Associated design team are masters with shaft-drive 4WD touring cars and the Apex platform continues that tradition. The entire drivetrain is designed to be bullet-proof and efficient without being overly complex. The blue anodized aluminum main drive and shaft steel CVAs not only look great but efficiently deliver all the power on-tap without twisting or flexing. The sealed front and reargear differentials can be tuned by swapping out the diff fluid to get you tuned in to practically any surface. 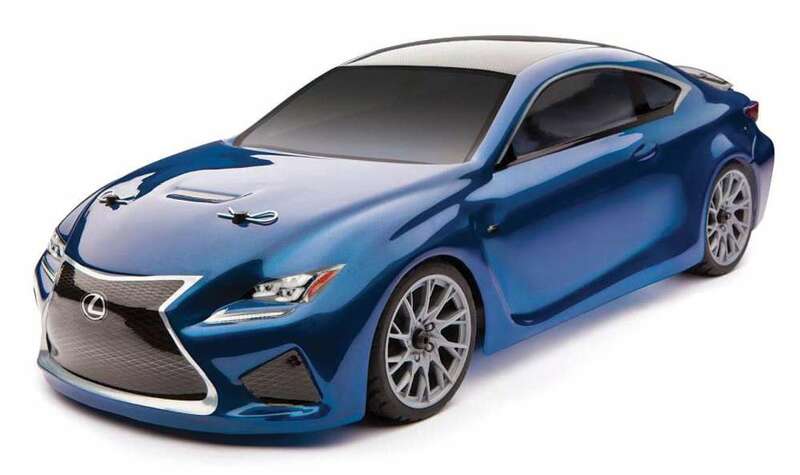 Team Associated includes some great running gear with the Apex Lexus RC F. A Reedy 3300Kv waterproof brushless motor and SC500-BL pro- vide plenty of speed and power under the hood. Providing the voltage is a Reedy WolfPack 6-cell NiMH battery pack with a low-loss T-plug. Controlling everything is Team Associated’s proven XP3G 2.4GHz radio system which pro- vides great range and a surprising number of tuning features for an RTR radio. In the end the electronics package is well suited to the chassis. You’ll often see the top-tier racecars of the past re-incar- nated into the RTRs of the future, and for good reason. HPI has taken inspiration from their RS4 Pro and Pro2 platforms which have won races around the world and evolved them into the Sprint 2. The BMW M3 GTS is the latest shell to top off the Sprint 2 chassis and looks great doing it. 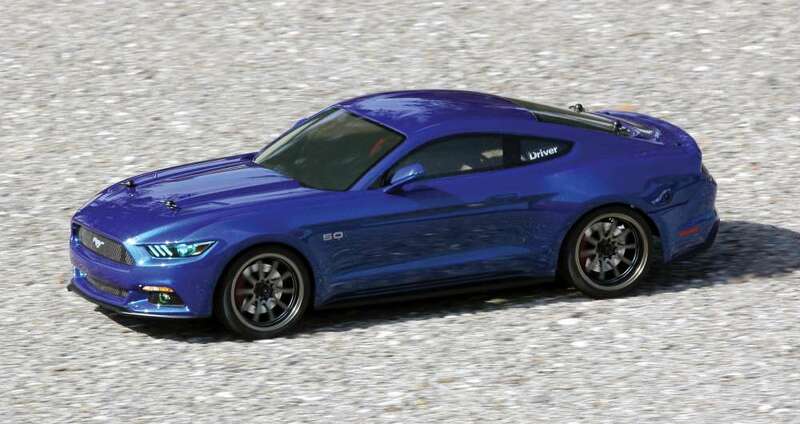 This RTR is designed for speed, style and performance and does all of these things quite well. sealed gear differentials are virtually indestructible, and with the amount of power this car has on-board they need to be. The Flux Brushless motor system delivers axle- twisting torque out-of- the-box. Dogbone driveshafts are used to transfer the power from the diffs to the axles front and rear. To keep everything rotating freely and efficiently the entire drivetrain spins on shielded ball bearings. The suspension on the Sprint 2 is not only very well equipped out of the box but it is also very tunable. The front and rear cam- ber links and the steering links are actually adjustable steel turn- buckles, an improvement for those seeking tunability on an RTR versus fixed links. There are multiple mounting locations for camber ball studs and steering ball studs, allowing you to adjust the roll center, camber gain and Ackermann. Like we said, being based on a former top-tier racecar has its advantages and these are just a few of them. If not for Tamiya we may never have known what a joy racing 4WD on-road sedans truly is. They invented the category over 20 years ago now with the TL-01, the on-road version of their proven Manta Ray 4WD buggy. 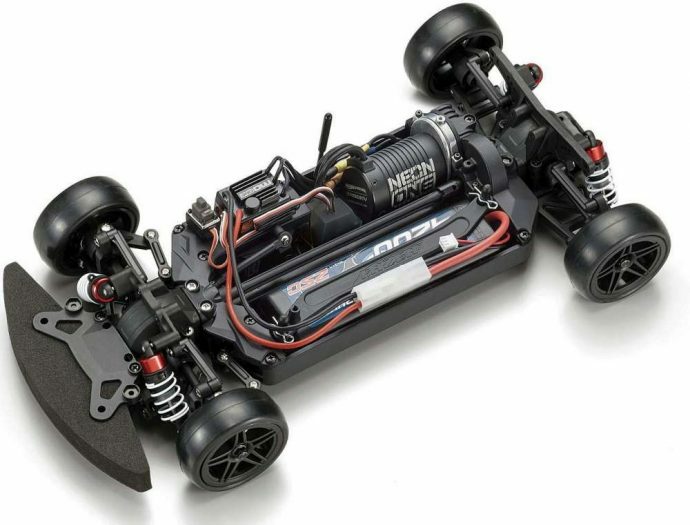 Over the years Tamiya has grown and expanded the on-road market thanks to providing great-looking cars that can win at any level, from the grass- roots Tamiya Championship Series to the IFMAR Worlds. Their Subaru BRZ R&D Sport is another example of how Tamiya com- bines their skill for exquisite body molds and beginner-friendly chassis. 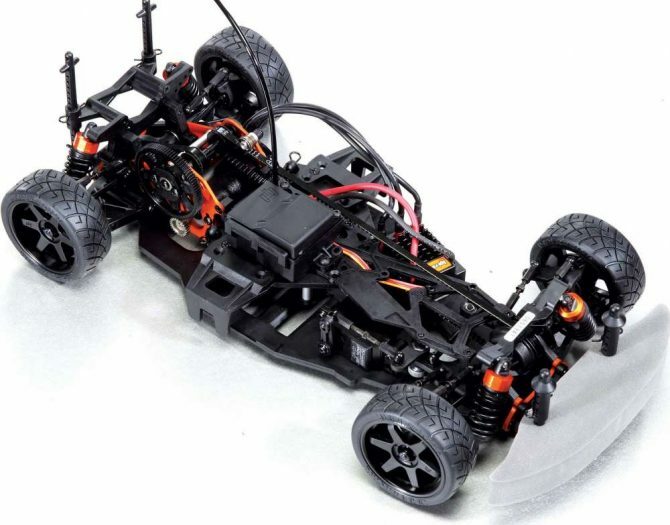 Under the BRZ body shell is Tamiya’s TT-01 ES chassis, which is actually 100-percent legal to use in the Spec Class of the Tamiya Championship Series. Designed to be simple yet effective, the TT-01 ES focuses on function over tunability. 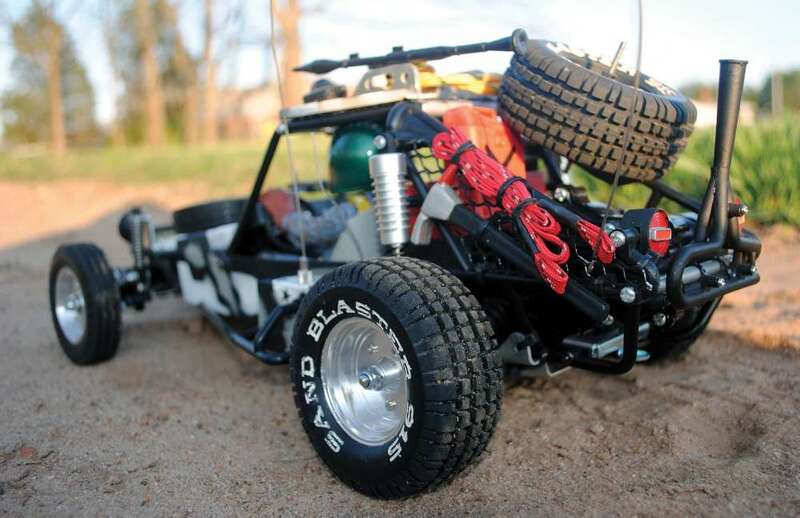 The chassis features fixed camber and steering links and friction shocks. The molded bathtub main chassis features an upper brace to help resist front-to-rear flexing and keep things aligned properly. The TT-01 ES uses a shaft drive 4WD drive system. Front and rear gear differentials can be filled with different greases to change the diffraction. However, they do not feature seals and cannot use silicone diff fluid. The center driveshaft is a single molded composite piece which keeps the drivetrain light. 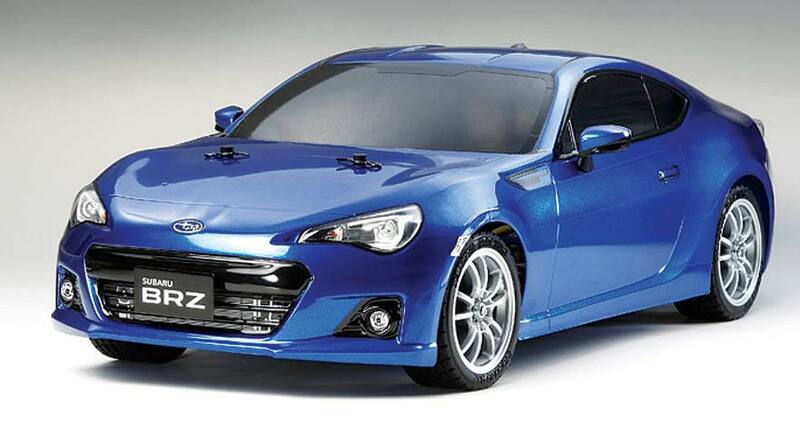 The BRZ is really something to look at and Tamiya has the looks down pat with details that would rival scale models. The sleek lines and details that have gone into the body really set it off. Subtle details like a front splitter, the flared side skirt and even the rear end faithfully recreate the original. Great looking multi-spoke wheels are wrapped with low-profile tires. You also get finishing touches such as sideview mirrors and amazing decals to really finish things off. 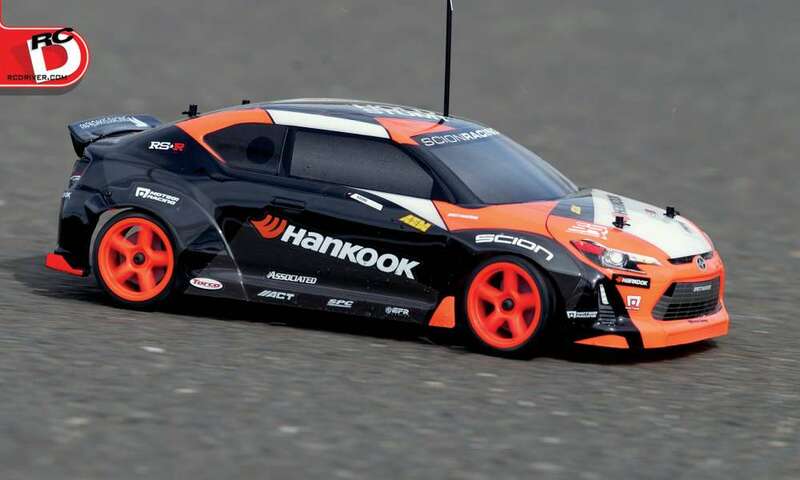 With the BRZ, Tamiya once again shows it excels when it comes to scale. A brushed 540 motor provides the power from the forward and reversing electronic speed controller. 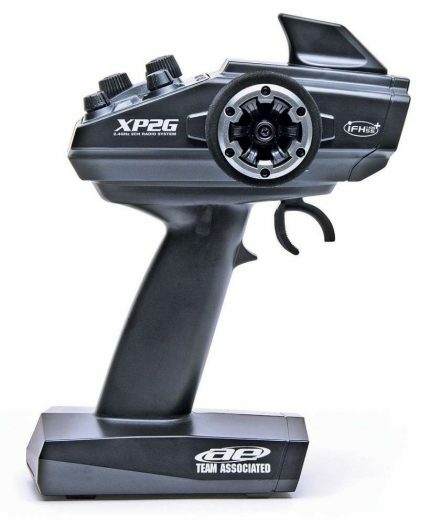 While not as fast as a brushless motor, this motor will get you to speeds between 20-25 mph. 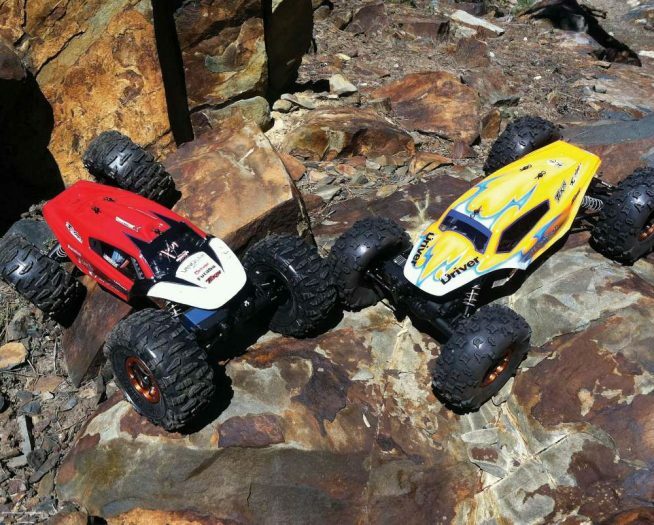 The Tamiya transmitter and receiver are no-frills but still more than capable of getting the job done. To complete the BRZ you’ll need to pick up a 6-cell NiMH or 2-cell LiPo battery and a compatible charger. Vaterra is the new kid on the block in the on-road arena but with entries like the 2014 Corvette Stingray they continue to impress. Vaterra’s close association with GM shows here with all the details that you’ll find in it, from molded brake rotors and discs to the Stingray’s signature Corvette logo on the center faux wheel nut. The scale detail that goes into the Stingray demonstrates that Vaterra can defi- nitely hang when it comes to scale details. The Stingray, like all Vaterra on-road cars, uses their V100 chassis for its backbone. This means it uses a shaft drive 4WD setup which is simple and efficient. A light-weight molded composite center drive shaft transfers power to the front and rear VTV, or Viscous Torque Vectoring, diffs. These sealed diffs are fluid fillable and designed to reduce diff slippage on loose surfaces and provide a very predictable feeling. Molded front and rear CVA driveshafts transfer power to the wheels while the entire drivetrain spins on shielded ball bearings. The suspension is simple, designed to make it easier for beginners out-of-the-box. Friction shocks provide the dampening while fixed camber and steering links keep things going straight. There is some adjustability built in to the platform, however, you can adjust spring preload and front caster by adding or removing pre-load clips on each one. 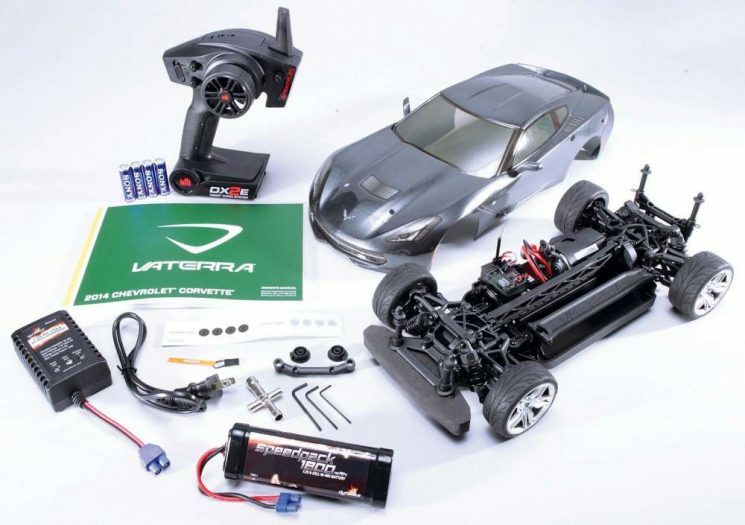 The Stingray is a complete RTR with everything you need in the box, even the main battery, charger and “AA”’s. A peak detection charger will top off the included 1800mAh NiMH battery in about an hour. 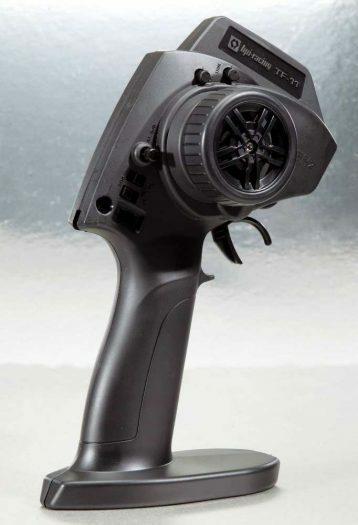 A sealed endbell brushed motor is mated to a waterproof forward and reversing electric speed controller and you should expect speeds of about 20-25 mph. A Spektrum DX2E 2.4GHz transmitter provides the control without interference. 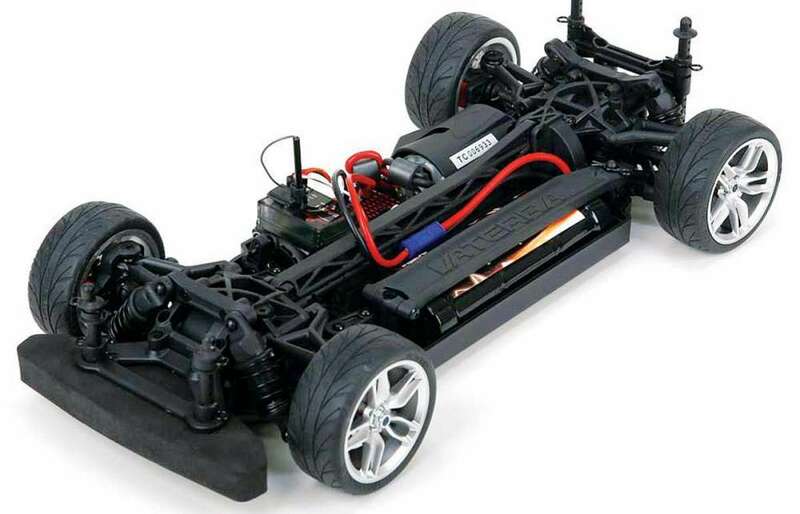 The Kyosho Fazer R8 is the only 200mm chassis in this group but it works quite well. The wider stance provides great stability; the R8 is nothing if not sure- footed. When making a wider chassis you often need to take liberties with the body but in this case the gorgeous lines of the Audi R8 are maintained perfectly. This is a low-slung, mean and lean street machine that you will be itching to open up and drive through the tight and twisties. The Fazer chassis is a molded bathtub configuration with front and rear braces designed to minimize flex. 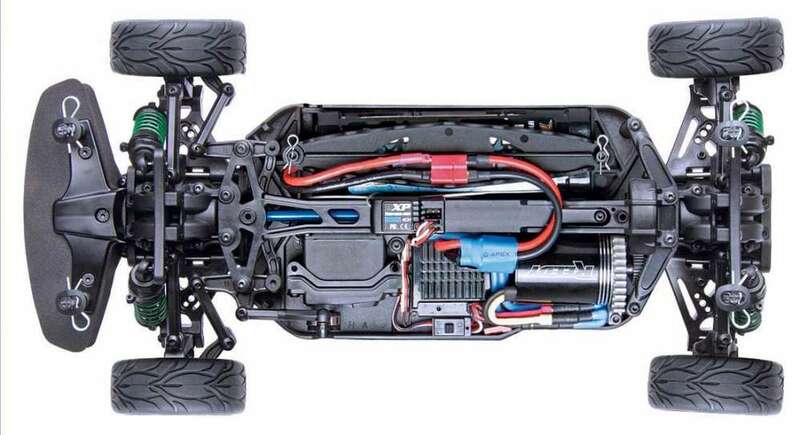 A molded center driveshaft splits the chassis into two halves with the battery mounted along the left side and the electronics mounted to the right. The Fazer is equipped with fluid-fillable front and rear gear differentials which, like all the moving parts, are supported by ball bearings. The Fazer is equipped with fixed- length camber and steering links, one less thing for beginners to worry about. Front and rear oil filled shocks feature composite bodies with two-piece aluminum and molded composite caps. The Fazer comes with a Team Orion 2400Kv Neon One brushless motor. A waterproof Team Orion R10 ONE ESC provides smooth throttle response whether speeding away or trying to back into the starting gate. Power is provided by a 6-cell 1800mAh Team Orion NiMH battery. 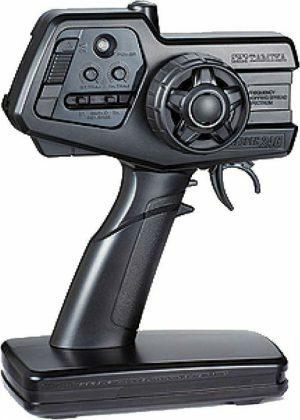 To control the Fazer, Kyosho has included their own Syncro KT-200 2.4GHz transmitter and four-channel receiver which work well and should provide you with range to spare. The Fazer R8 body is unique in a number of ways. It doesn’t fea- ture an elaborate paint or trim scheme; the body is available in basic black with the appropriate scale trim decals. But like a black suit there’s something classic about this body. It looks fast even when it is sitting still or on display. Five-spoke black wheels have slick rub- ber tires pre-glued for you. Is drifting more your style? Never fear as Kyosho includes a second set of drift tires you can slip on when the urge to pitch it sideways is irresistible. As these five exceptional whips go to show, there’s never been a better time to get involved in electric on-road touring cars. You can not only have a selection of exceptional looking cars but also great performance cars, too. The time is now to get charged up, lay down the track dots, and hit your local parking lot or on-road track and have some awesome scale-looking fun.